Great iron at a great price. 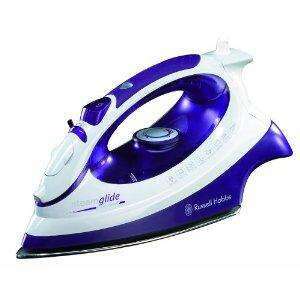 The new Russell Hobbs Steamglide Professional Iron is styled in a rich purple colourway and boasts 2400 W of power. Its ceramic soleplate will effortlessly glide over fabrics, cutting down on ironing time and it also has a large 350 ml large transparent water tank, meaning less time is spent refilling. Featuring variable temperature and steam settings, plus a powerful 40 g/min steam output and 95 g shot of steam for easier ironing, the Russell Hobbs steamglide professional iron gives you high performance at your fingertips. Another great time saving feature is the irons powerful vertical steaming facility, ideal for removing wrinkles from furnishing fabrics, curtains and from hanging clothes quickly and easily, without having to take them down. The fine mist water spray is perfect for dampening dry areas and the iron can even be used as a dry iron if required. Incredibly the features don't end there, as the iron includes a self-clean function with anti-scale agent to prevent the build-up of scale, an anti-drip mechanism to prevent water leaking onto garments and also a 360-degree swivel cord guard for added convenience.